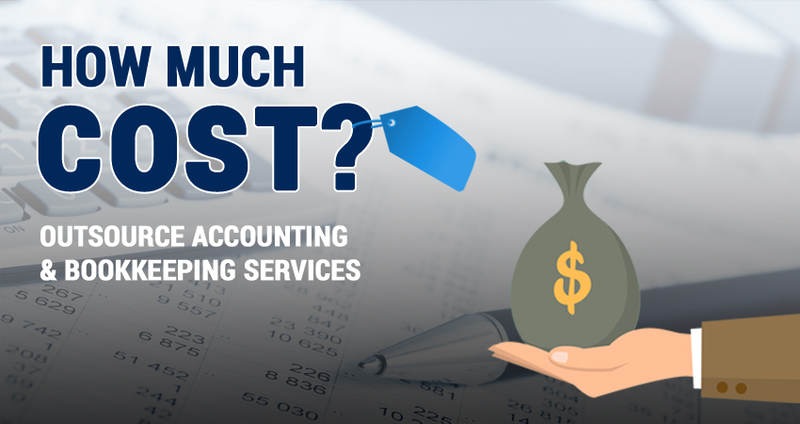 »Blog»How Much Does It Cost to Outsource Accounting and Bookkeeping Services? How Much Does It Cost to Outsource Accounting and Bookkeeping Services? Competition has taken over the business sphere completely. Organizations, large or small, have constantly to be on their toes to survive the competition, and succeed. Things become more complex for small enterprises, since, they have to fight on all fronts single-handedly. Due to resource constraints, it becomes difficult for them to allot separate funds and manpower to take care of non-core, yet important tasks. Therefore; business owners prefer outsourcing accounts management to a reliable accounting and bookkeeping service providers. The concept of outsourcing has various questions and apprehensions, surrounding it. The most common question every small business owner poses is “How much does outsourcing accounts management to accounting and bookkeeping service providers cost?” or they often want to know the hourly rate to hire a bookkeeper or hire an accountant. While sometimes, they simply want to know an approximate estimation of how much will it really cost for a long term bookkeeping service. The bottom line of all these questions is basically a single source of concern – The cost! Cost is always an important aspect in the decision-making process. It is necessary that all aspects are taken into consideration, including the financial budgets to determine whether it can accommodate the cost of outsourcing accounting and bookkeeping activities. Outsourcing companies these days, have no fixed pricing matrix. Most of the time, they customize their service solutions. Moreover, pricing matrix mostly depend on the level of complexity and the intricacy of the work needed. Hourly price for bookkeeping outsourcing services – is it feasible? Usually, it is not always feasible for outsourcing companies to go for hourly prices. Most of the time, for your productive and effective businesses, while considering several other factors, billing at an hourly price hardly seems to be a sensible option. It is important to understand that not all accounting and bookkeeping tasks are always easy. It depends, a lot, on specific business requirements. There might a section of clients who want an elaborate reporting and details of finance management, which demands close supervision by exceptionally skilled professionals. Moreover, these experts also require to handle and check more than the usual bookkeeping tasks. In fact, many outsourcing service providers assess the estimate time frame which is required to carry out each accounting job. Based on this, they set up a monthly or fixed price depending on the complexity of the work. This tends to yield quantitative outputs at a very reasonable price. It is widely observed that most of the businesses prefer to have options as far as their accounting and bookkeeping service providers are concerned. From variations in regularity which augments or decrease the amount of times a work is carried out to service add-ons that enhance or reduce the complexity of reporting and analysis, many outsourcing companies offer three tiers service for outsourcing estimates. Some observations of variations include the regularity of review with a controller, preparing staff expenditure report, payroll processing as well as sales tax reporting. In rare cases, basic modifications in regularity, like monthly to quarterly, may have considerable influence on the costs.